Play bubbleshooter for free on bubbleshooter.com, this is the must played bubble shooter version, you move the arrow with your mouse. Click to release the bubble. Make combinations of 3 or more bubbles to make them disappear and score points. The more bubbles you shoot at once the more points you get. You win if all bubbles are shooted, if there are only a few lines left you can shoot away colors by making groups of the last balls. 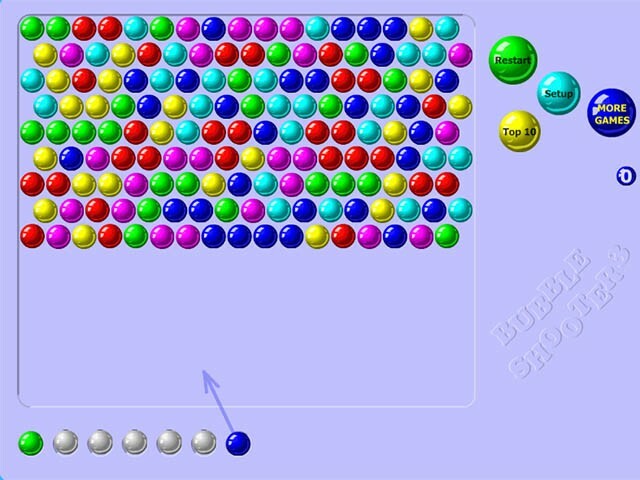 Play the original Bubble Shooter, this is the most played bubble shooter version ever. Make combinations of 3 of the same bubbles by shooting them at each other. If you have 3 or more bubbles the same, they disappear. Shoot until you have unlocked the entire playing field. Bubble Shooter is our number 1 game, no other game has been played that much. This version works on mobile, tablet and PC. This way you can play bubble shooter wherever you are. This version has a clear playing field and beautiful colors. The game is ready when you have cleared all the bubbles. Beware, if you miss some bubbles (so don't make combinations), new bubbles will form in the field, which makes the game quite challenging. Make sure that you always make combinations of bubbles or make sure that if you cannot make a combination, you should put the bubble away properly for the next bubble. For example, you can shoot a blue bubble under 2 red bubbles, if you get a red one you can shoot the red bubbles away so that the blue one goes along. If you get to the end you can also play away colors, for example remove all yellow bubbles, now no new yellow bubbles will be added in the future. If you do this color by color, it will become easier as you progress. This strategy makes it possible to complete this game. This is the main screen of bubbleshooter. This displays the bubbles, the shooter and the remaining bubbles before a new line spawns. 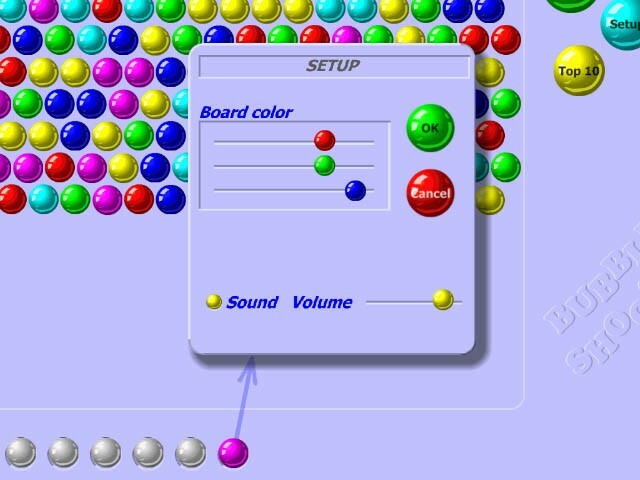 The settings screen of bubbleshooter, here you can change the board color and change the sound volume.